As one of Japan’s most innovative hospitality groups, a pioneer of eco-tourism and of the contemporary onsen, it comes as little surprise that Hoshino Resorts has now turned its attention to a modern reworking of that upscale Japanese institution, the ryokan. Its latest offering is the Hoshinoya Tokyo hotel. Set among the straight-laced skyscrapers in the city’s financial district, the property – at just 17-storeys – might not be one the loftier hotels in Tokyo, but what it lacks in height it makes up for in clever design choices, courtesy of local outfit Azuma Architects. The elegant black-latticed facade – inspired by an ancient kimono motif – is indicative of the understated luxury that lies inside. Fourteen of the floors are each set up to resemble a traditional Japanese inn, with six guest rooms surrounding a central living space. 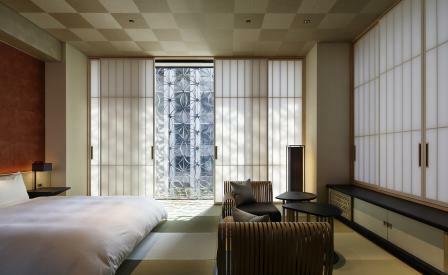 The attention to detail is evident in the tatami flooring, washi paper shoji screens, low-lying furnishings and soft considered lighting that seduces you to don your yukata and pad around freely. Dining is done in the restaurant or, for the traditionalist, in-room. The the 17th floor is home to an indoor/outdoor onsen, supplied from spring waters 1,500m below the bustling Tokyo streets.